About 7.1 million people received federally administered payments in December 2005. The average monthly payment in December 2005 was $439. Total payments for the year were more than $36 billion, including about $4 billion in federally administered state supplementation. The majority were female (57 percent). Fifteen percent were under age 18, 57 percent were aged 18 to 64, and 28 percent were aged 65 or older. Most (82 percent) were eligible on the basis of a disability. Almost 6 out of 10 recipients under the age of 65 were diagnosed with a mental disorder. More than half (56 percent) had no income other than their SSI payment. Thirty-five percent of SSI recipients also received Social Security benefits. Despite their disabilities, about 328,000 recipients (5.6 percent) were working in December 2005. Since 1974, the Supplemental Security Income (SSI) program has guaranteed a minimum level of income for needy aged, blind, or disabled individuals. Each year, we issue a report that presents data on the SSI program and the people who receive benefits from it. The report covers such topics as federal benefit rates and total annual payments, federally administered payments, work incentives, applications, outcomes of applications, awards, denials, and suspension of benefits. The section on federally administered payments includes a table showing country of origin of the nearly 1.5 million SSI recipients who were born in a foreign country. Finally, in response to numerous inquiries for data at the state level, we have provided state distributions for applications, awards, recipient rates, and receipt of Social Security and SSI on the basis of disability. Alfreda M. Brooks compiled the data and prepared the report for publication. Staff of the Division of Information Resources edited the report and prepared the print and electronic versions for publication. In July 2001, the Social Security Administration made retroactive lump-sum payments to correct an error in the cost-of-living adjustment for 2000 and 2001. The data in this report reflect the federal benefit rate actually used for Supplemental Security Income payments ($512 for 2000; $530 for January through June 2001). With the 2005 report, we changed the calculation of the average monthly payment for Table 23 and Table 27 to agree with calculation of the average monthly payment for Table 4. The calculation excludes payments made in the current month for prior months of eligibility so that large retroactive payments do not distort the averages. 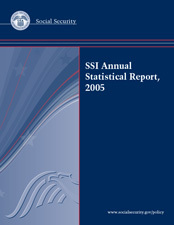 The tables on Noninstitutionalized Recipients based on the Survey of Income and Program Participation (SIPP) have been removed from the SSI Annual Statistical Report, 2005. Because of increased attrition over time and increasingly low match rates to administrative data, we could no longer make reliable estimates based on the SIPP. The Office of Research, Evaluation, and Statistics (ORES) contracted with the Census Bureau to conduct a special SIPP-based interview of SSI recipients and SSI beneficiaries. Estimates based on the additional data were not available at the time of this publication. However, ORES anticipates publishing these estimates in an alternate publication as well as highlighting the changes in the data and the reliability of the estimates. This decision reinforces the inherent differences between the survey data used to produce the Noninstitutionalized Recipient estimates and the administrative data used in this publication. Because of variations across states in reported numbers of recipients and payment amounts of SSI state-administered state supplements, information on state-administered state supplements has been dropped from this publication.